Suzette suffers from Crohn’s disease just daily living can be a challenge. With the added pressure of trying to raise a daughter who thwarts her every move Suzette finds she must take desperate steps to distance herself from the problem. Suzette’s husband Alex was her knight in shining armor, together they have forged out the perfect life, that is until Hanna was born. Hanna now 7 will not or can not speak. She communicates with grunts and signing. She prefers to be homeschooled and sabotages any attempts at attending a regular school. Suzette has found herself losing her identity. Her waking hours are spent trying to maintain the façade of perfection, but the cracks are beginning to appear and are widening quickly. Hanna is a very manipulative little girl who uses her wiles to charm her father while behind his back she cruelly destroys her mother. Things can only go on for so long before reaching the breaking point. Ah, and what surprise when it does! Secrets are revealed, and we find things are not what they seemed. While the premise was good I found the story to be lacking a bit. Zoje Stage’s characters felt shallow and I didn’t really feel anything for them one way or the other. There were times when some of Hanna’s thoughts/actions were just not what one would imagine for her age level. I’m not saying the story is bad or you shouldn’t read it, I just regret paying full price for the book. Of course, this is just my opinion and looking over the Amazon reviews a lot of people loved it. For me, if it were a movie I would wait until it was on Netflix. If any of you have read the book I would love to hear your thoughts. 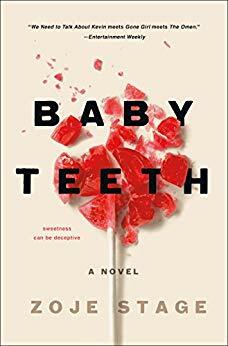 You can pick up Baby Teeth HERE! !